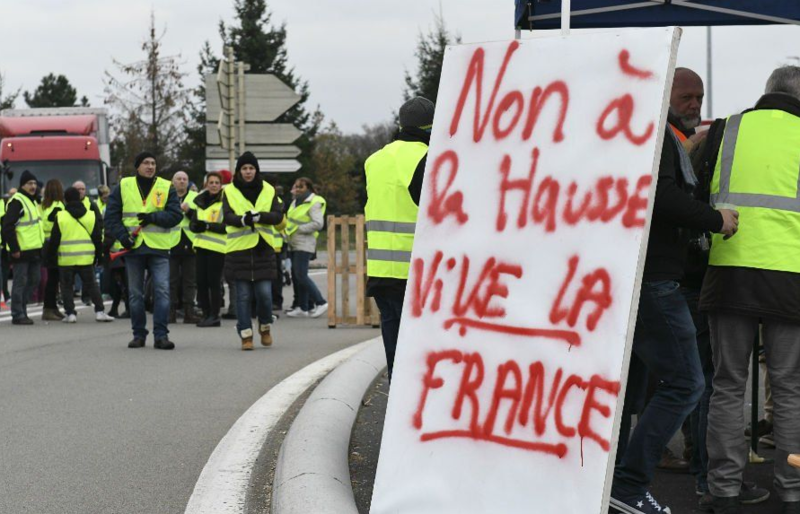 According to official figures, some 50,000 French citizens are currently participating in the ‘gilets jaunes’ (yellow jacket) protests against the high fuel prices in the country. All around France, 1,000 roadblocks have been set up, leaving empty roads, embarrassed government figures and a lot of frustrated drivers trying to get to their location. In the Savoie region, a woman drove into a group of yellow jacket protesters who had blocked the road towards the city center and hit a female protester with her car. The woman, unfortunately, died on her way to the hospital. According to Interior Minister Christophe Castaner, the accident occurred near the city of Pont-de-Beauvoisin. The woman at the wheel of the car was on her way to the doctor with her daughter, who was visibly sick. She was confronted on the way with an unannounced action by a group of forty to fifty activists. Related coverage: <a href="https://thegoldwater.com/news/42458-France-Nationwide-Protests-Start-President-Macron-Is-Stealing-Our-Money"> France - Nationwide Protests Start ‘President Macron Is Stealing Our Money’</a>. The newspaper Le Figaro reports that the demonstrators knocked on her car, urging her to turn back home, whereupon the mother in a panic attack tried to drive away from the crowd, with the sad collision as a result. The woman is in shock and was taken away by police for interrogation. It was not the first incident of the day. In Grasse, a motorist who was not sympathetic to the protests tried to drive onto a blocked roundabout. A police officer who tried to break up the fighting groups was injured as a result. The protesters are angry at the French government of President Emmanuel Macron (who is seen by them as an ‘elitist banker’) for abandoning "the little people". Mr. Macron’s popularity is at records lows of 28%. Rightwing right leader Marine Le Pen, who was defeated by Mr. Macron in the second round of the presidential election, has been encouraging the movement on Twitter.